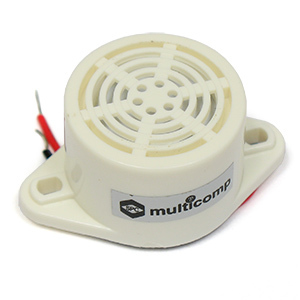 Small electronic buzzer by Multicomp produces a pleasant buzzing sound when 12VDC is applied. Size about 1" diameter X 0.7" tall with mounting ears that extend the base to 1.6" (mounting holes are on 1.25" centers). Has flexible color coded leads for power input. Sold in package of 8.